It may not be the electric car you were dreaming about, but the USurfers from Urbanmover provide another environmentally-friendly way to get around a crowded urban city center. 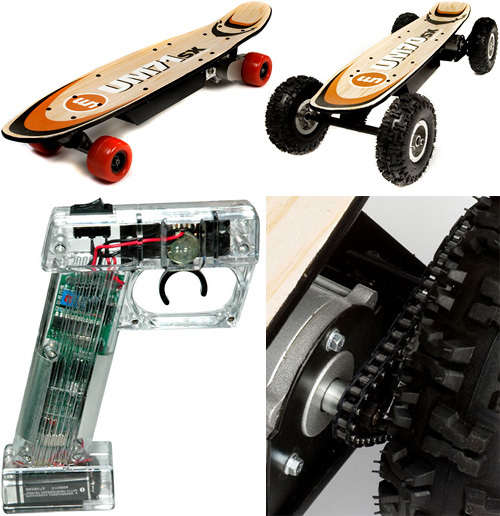 While they both feature a skateboard deck, the UM71sx (pictured top left) has a set of nylon wheels while the UM70sx (pictured top right) has a set of larger rubber wheels that look suitable for off-road terrain. They both take advantage of a 36V, 800W rare earth magnet electric motor that will run for about 4 to 6 hours on a single charge (with a top speed of about 20mph) with stepless acceleration provided by a wireless, pistol-grip style throttle. The USurfers even come with an electronic ABS regenerative braking system to harness the power from stopping and slowing to recharge the battery. Sadly, there doesn’t appear to be any pricing info for either model on the Urbanmover website, and the “Launch date May 2008” message isn’t that encouraging either. I want this so bad, I also want the wheelman and the powerizer jumping stilts. As far as skateboarding goes these gadgets look INSANE. They afre is gonna sell like crazy as skateboarding is a recent phenomenon that has taken society by storm. Since its invention, skateboarding has spread throughout the world, and there are skaters in most countries of the world, on every continent (except perhaps Antarctica). You can find more stuff on http://skateboards.eu/ .